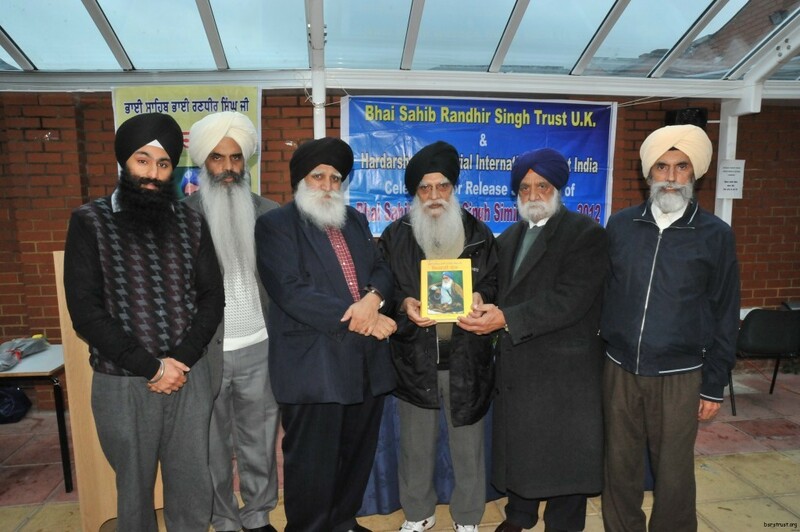 Bhai Madan Singh (Birmingham) releasing Simrati Granth along with (from left) Bhai Jujar Singh, Bhai Jagtar Singh Sandhu, Bhai Jaiteg Singh Anant, Bhai Surjit Singh Bilga and S. Hardial Singh Grewal. Southall, London: In memory of the 100th year Anniversary of the Gadhar Party movement, the Hardarshan Memorial International Trust and Bhai Sahib Randhir Singh Trust UK released “Bhai Sahib Bhai Randhir Singh Ji Simriti Granth” on 28th October 2012. In the presence of many scholars, writers, media persons and community elders, the Smagam commenced with the appointment of an Honorary Presiding Board comprised of eminent scholar Bhai Madan Singh, distinguished writer Bhai Jaiteg Singh Anant, voice of Canadian Sikhs Bhai Jagtar Singh Sandhu, and well known Bhai Jujar Singh. Firstly, Bhai Jujar Singh approached the podium to commence the ceremony by greeting the congregation and welcoming the guests and audience from far and wide, before explaining the layout of the program. Following this Bhai Jagtar Singh Sandhu gave an eloquent speech on Bhai Sahib Randhir Singh’s sacrifice towards the freedom of India and the many aspects of his life. He continues to tell the audience that the Simrati Granth will awaken a new spirit within the Sikh nation throughout the world. The Editor of the Simrati Granth, Bhai Jaiteg Singh Anant (Canada) then gave a speech on the various aspects of Bhai Sahib’s life and many important social, historical and religious related issues. He spoke of Bhai Sahib’s jail letters which are included in the Simrati Granth and have not been printed before. He gave a summary of the contents of the Granth, which includes many remarkable rare pictures of historical importance to both Bhai Sahib and the Ghdar movement. He further announced that the Trust is currently preparing and English version for readers in the West. Bhai Madan Singh spoke about selected works of Bhai Sahib’s gurmat philosophy and said that every part of Bhai Sahib’s way of life was a shining example which we should study through his literature and learn from. He went on to say that Bhai Sahib’s books have changed thousands of lives around the world. They have also helped to clear much confusion and many misconceptions. They also mentioned that Bhai Sahib should not only be known as the creator of one single organisation, but a great leader of the Sikh Panth, since his sacrifices were for the entire Khalsa Panth. In this smagam Bhai Jaiteg Singh Anant and Bhai Jagtar Singh Sandhu jointly presented the ‘Bhai Sahib Randhir Singh Memorial Award’ to Bhai Madan Singh (Birmingham) and Subedar Dharam Singh Sujjon (Leicester). They were honoured with a citation and given a dastar, shawl, plack, portrait of Bhai Sahib, a copy of the Simriti Granth, and a bouquet of flowers. In the same way, Bhai Jujar Singh (London) was presented with the ‘Bhai Balbir Singh Memorial Award’, which was presented in honour of Bhai Balbir Singh’s [son of Bhai Sahib Randhir Singh] 100th birth anniversary. Subsequently, on behalf of Bhai Sahib Randhir Singh Trust UK, Bhai Jujar Singh presented Bhai Jagtar Singh Sandhu with a dastaar, shawl and bouquet of flowers. 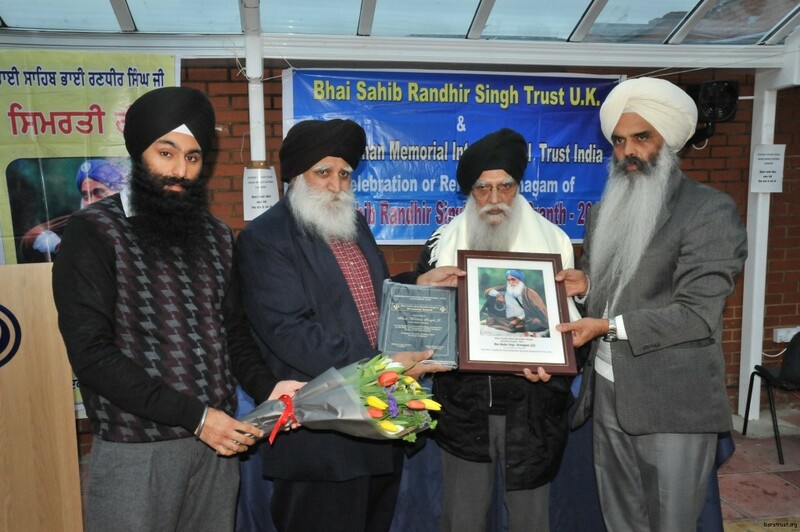 Bhai Jaiteg Singh Anant and Bhai Jagtar Singh Sandhu presenting Bhai Madan Singh with the Bhai Sahib Randhir Singh Memorial Award. Also standing in the photo – Bhai Jujar Singh. 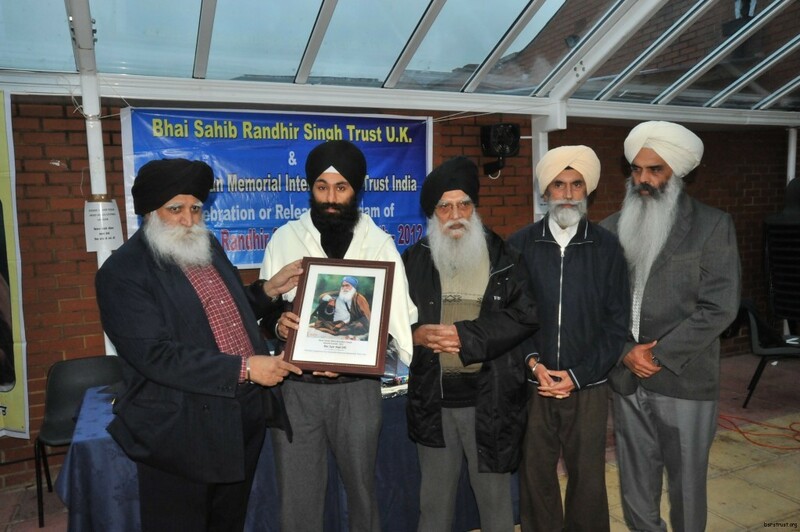 Bhai Jaiteg Singh Anant presenting Bhai Jujar Singh with the Bhai Balbir Singh Memorial Award (on the 100th Anniversary of Bhai Balbir Singh’s birth). 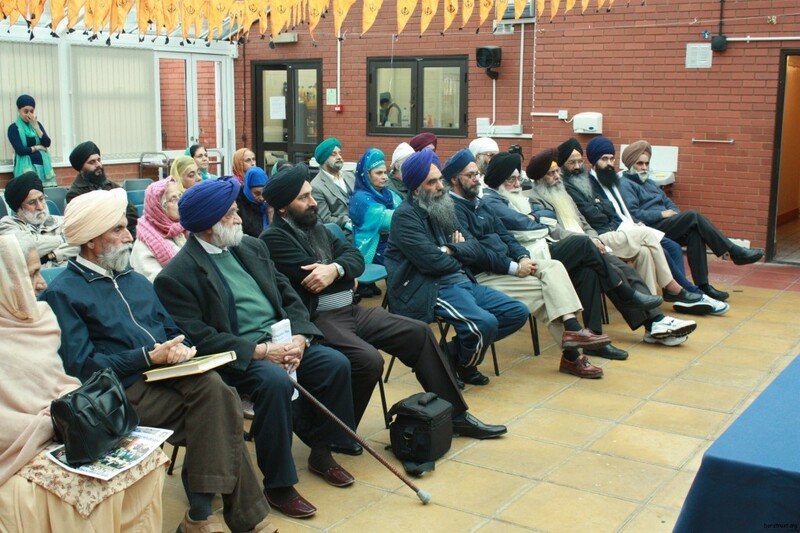 Also standing in the photo are Bhai Madan Singh, Bhai Hardial Singh Grewal and Bhai Jagtar Singh Sandhu. Simriti Granth was released with jakaray of ‘Jo Bole So Nihaal – Sat Sri Akaal’ by Bhai Madan Singh. Thereafter, the first copy of the “Simriti Granth” was presented by Bhai Jaiteg Singh Anant to Bibi Kirpal Kaur (UK), who had the fortune of Bhai Sahib’s Sangat for many years. Also presented with a copy of Simrati Granth by Anant were S. Hardial Singh Grewal [son of Dharam Singh – Headmaster of Malwa Khalsa School, which was considered to be the nursery of the Ghadarites], Bibi Hardeep Kaur [Granddaughter of Bhai Sahib Randhir Singh], S. Surjit Singh Bilga [Trustee, Sri Guru Singh Sabha, Southall], S. Avtar S. Buttar [General Secretary, Sikh Missionary Society UK] and Manpreet Singh Badhni [Journalist]. 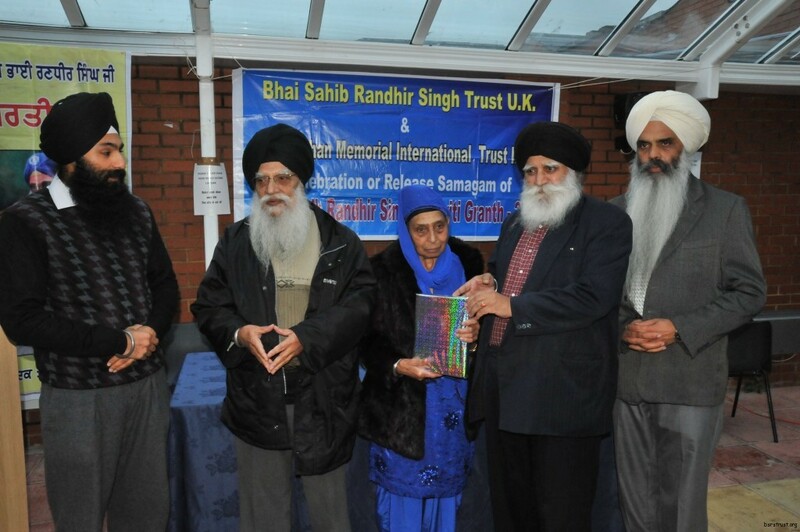 Bibi Kirpal Kaur UK being presented with the first copy of Simrati Granth. Also present are Bhai Jujar Singh, Bhai Madan Singh, Bhai Jaiteg Singh Anant, Bhai Jagtar Singh. The smagam ceremony lasted for two and a half hours in which some very notable scholars, writers and leading members of Gurdwara organizations which included: S. Surinder Singh Purewal [former General Secretary of Sri Guru Singh Sabha, Southall], Bhai Harcharan Singh, Bhai Tejinder Singh Sekhon, Bhai Charankamal Singh Sekhon, Bhai Bhipinder Singh Bedi, Bhai Amarjit Singh Dhillon [Sri Guru Singh Sabha, Southall], Bhai Satnam Singh, Bhai Jatinder Singh, S. Surjeet S. Jeet amongst others. In the warm memory of Bhai Sahib Bhai Randhir Singh Ji, this historical memorial smagam in the UK was a great success and left the audience with some heartfelt memories. This Simriti Granth is something extraordinary as it is compiled of numerous articles on Bhai Sahib’s life written by eminent University scholars and historians from around the world particularly India, North America, and the United Kingdom. Various scholars and historians have written on many aspects of Bhai Sahib’s life, from his spirituality to his role as a Sant Sipahi (Warrior Saint). These qualities are beautifully presented in the Simrati Granth, and is available around the world.